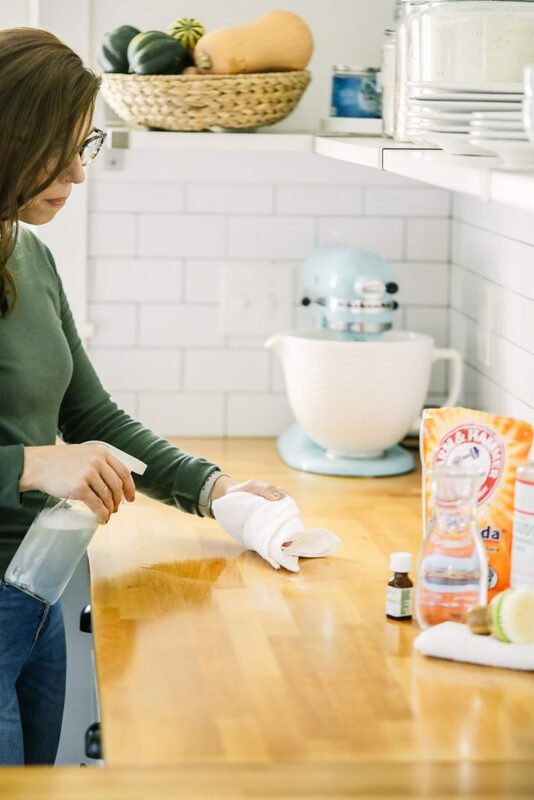 Over the course of three weeks (technically only two now, this week and next week), we’re taking some time to talk about the basics of homemade cleaning. 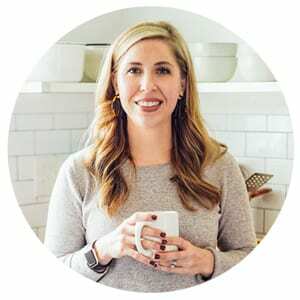 There is SO much information on the web these days about homemade everything, and Pinterest has become the land of Mrs. Do-Everything-Super-Mom. With all of this information floating around in our brains, I believe it’s important to get back to the basics. Getting back to the basics is exactly what we’re focusing on during this series. 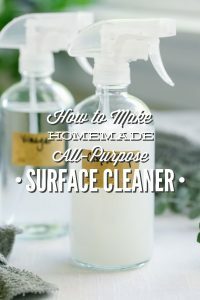 We’ve talked about the ingredients needed to make basic cleaning products at home (and hey, it’s okay to purchase more natural store-bought products; I have nothing against that decision), my recommended tools for natural cleaning, and how to make two basic homemade surface cleaners. 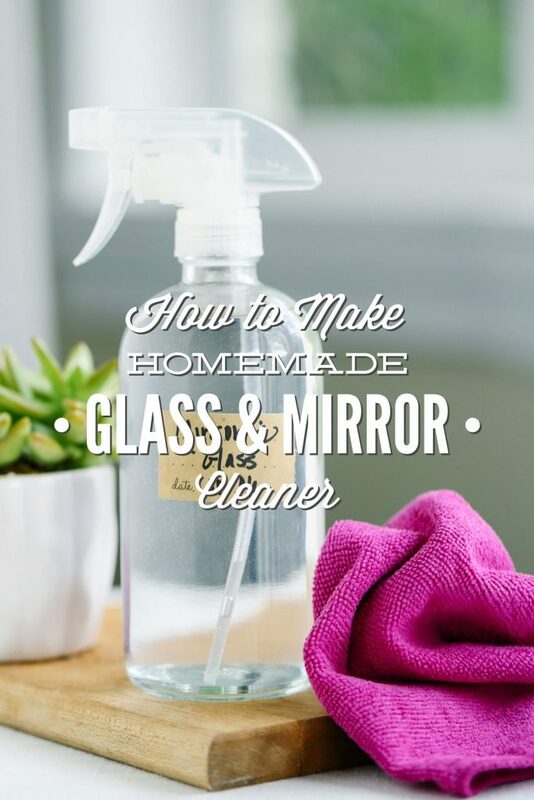 Today, we’re going to make an easy glass and mirror cleaner. Growing up, my mom cleaned the mirrors and windows in our home with a famous blue liquid. This liquid, and the scent that came with it, represented “clean” in our home. 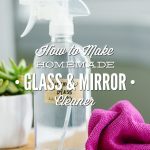 I’m so glad glass cleaner was one of the first cleaning products to be questioned when we began to make the switch to using more natural products in our home. 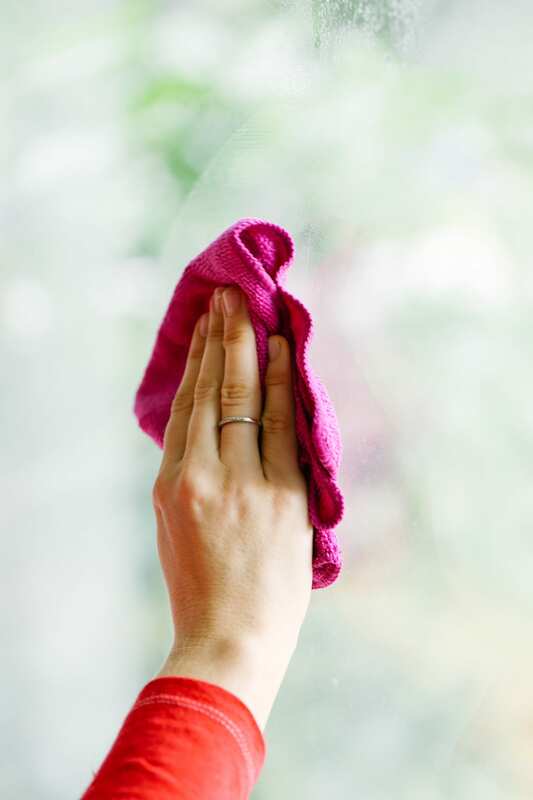 Let’s take a look at the ingredients listed on the Windex website (just one of many window and glass cleaner brands on the market): Water, 2-Hexoxyethanol, Isopropanolamine, Sodium Dodecylbenzene, Sulfonate Cleaning, Lauramine Oxide, Ammonium Hydroxide, Fragrance, Liquitint® Sky Blue Dye. Common household ingredients, right?! Nothing like an ingredient list that makes you wish you paid more attention during high school chemistry class. If you’d like to know more about the risks and dangers that may be associated with any ingredient you don’t recognize on an ingredient list (because they probably weren’t covered in high school chemistry class), check out the Environmental Working Group’s Database. The EWG grades nearly all ingredients found in common cleaning products in the United States. Just reading the word fragrance in the ingredient list, above, raises a big red flag. 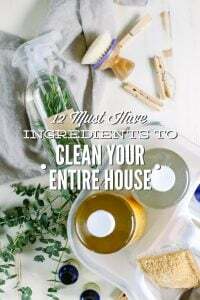 This term usually means you’re holding a cleaner that’s filled with multiple lab-generated chemicals, blended together to create the “clean” scent many of us have come to expect from a cleaner and our homes. Lots of ingredients can be hiding under this vague ingredient name, including phthalates (which are believed to disrupt hormones and be carcinogenic). Now I get it, the rational answer is not to “throw the baby out with the bathwater.” I understand that we don’t live in a bubble. I still use some plastic products in our home (just to name one example) and probably come in contact with phthalates, and other ingredients, just by continuing with daily routines outside our home. 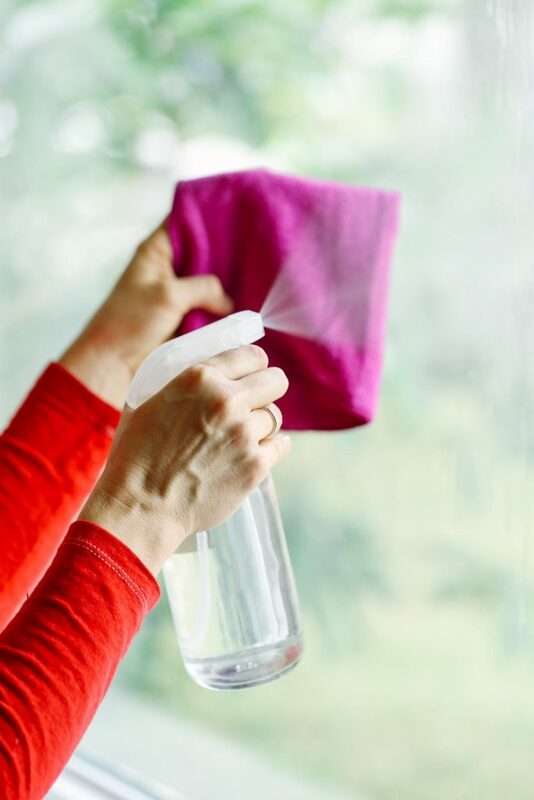 But when an alternative solution exists for something that’s sprayed in our home environment regularly, like glass cleaner, and that solution only takes 60 seconds to pour into a bottle and spray on my windows and mirrors, why not give it a shot! 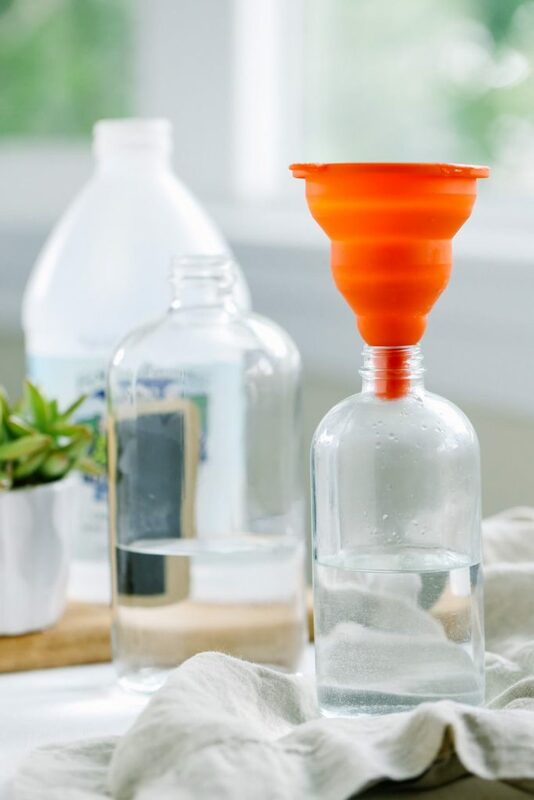 Today, my goal is not to scare you, but rather to show you just how easy it is to make homemade glass cleaner at home. Let’s get started! Add the alcohol and vinegar to a 16oz. glass spray bottle. 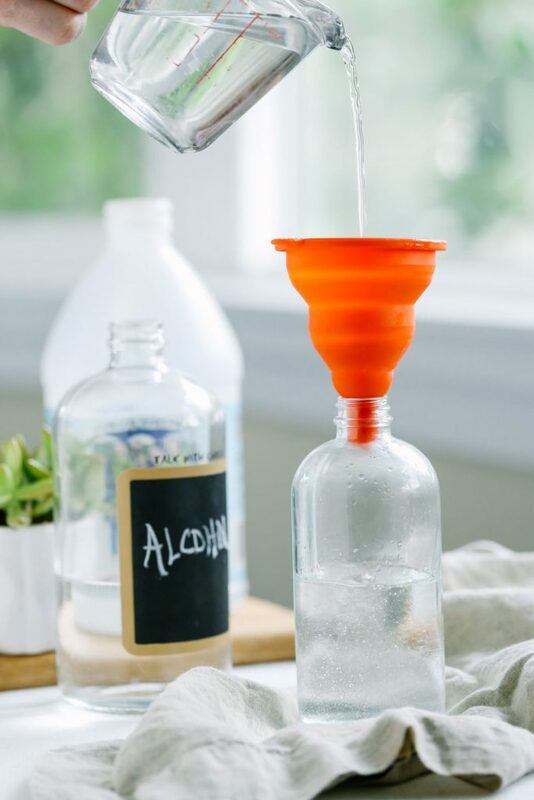 Add water until the bottle is full (use a funnel, if needed). 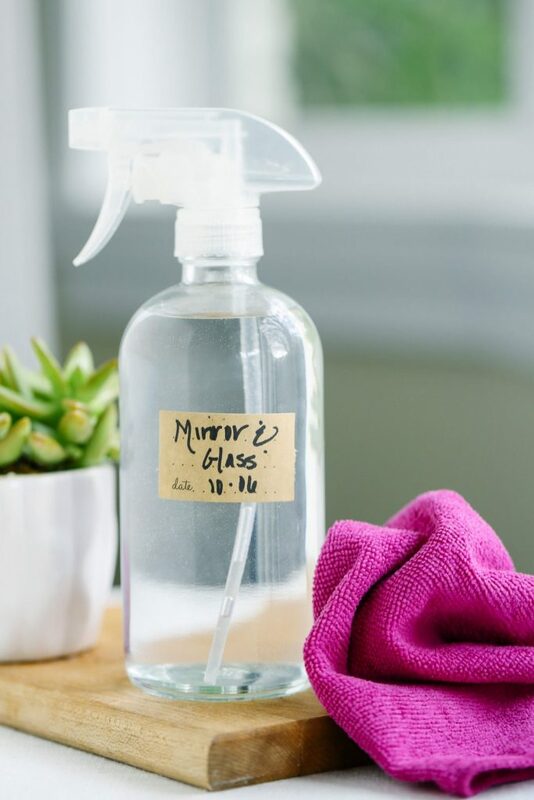 If you don't care for a vinegar scent (although it goes away once the surface dries), add a few drops of your favorite cleaning essential oil. This cleaner may be stored at room temperature. *I know some people in the natural community avoid rubbing alcohol for cleaning purposes. A high-proof vodka may be substituted for rubbing alcohol. Wow! I first made the powdered foundation. Needed it a wee bit darker. Then the face cleanser! Then the body wash! Tomorrow will be the window cleaner! Wow, wow, wow! This is si exciting! I am a naturest of the 60’s. Rose hip jam, eating greens from my yard, then I found your site. The next is shampoo. My hair has become so thin from any I have used. What do you sugest? I am a big fan! I believe in passing on good information too! Keep doing what youare doing to make it a better place. Years ago I stopped eating stuff that had ing that Icouldnt pronounce. What is there about high frutoise that ussi bad? That’s awesome, Frances. It’s so great to hear the blog and recipes have been so helpful! I still use store-bought shampoo (since I haven’t been pleased with homemade alternatives just yet), and really like the brand EveryDay Shea. I don’t know much about other more natural brands, so I’d recommend taking a look at the EWG for shampoo recommendations. High fructose (corn syrup) is a highly processed lab-generated sugar product and usually made from genetically modified corn. It’s incredibly cheap to use in processed food. We try to avoid any forms of highly processed sugar. I like that your recipe doesn’t include cornstarch, which the popular recipe on Pinterest has. I found it left a film on my mirrors. Glass and Mirror cleaner was the first thing I replaced when I was expecting my son. I think it’s a good place to start since it doesn’t require essential oils or liquid soap one may find expensive or unavailable at first. Also, this cleaner doesn’t require a glass bottle that can be scary in the beginning especially if you have little ones. I’m so glad you are doing this series, I never even thought about home cleaners being heavily laden with toxic chemicals until I read that pregnant woman should avoid cleaners as much as possible in the booklet my doctor gave me on my first visit. I threw my cleaners out, made my first homemade glass/window cleaner and for a while used vinegar and baking soda to clean everything else, which didn’t work too well and didn’t smell too well, I might add. Then I found your bathroom cleaner and it changed the way I clean my home! No more hours of elbow grease, and complaints from the hubby, not to mention my own nose. Thank you for your excellent work and your passion for sharing the knowledge you gain. Hey Bethany, Wow! I had no idea pregnancy booklets recommend avoiding cleaners…very interesting! I’m so glad you’re loving the bathroom cleaner and the series! 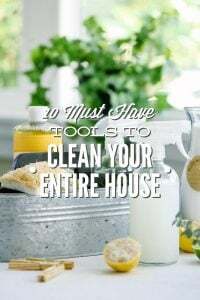 For the past few months I have been trying to get chemical filled cleaners out of my home. Thank you for all your great DIY cleaners. So far I have made liquid laundry soap (awesome! it even took out some old stains the other chemical soap couldn’t), foaming hand soap (love it), mirror and window cleaner (my windows and mirrors in my house have never looked so good!). Thank you so much. I love your website an I am going to continue to keep using your DIY cleaners for my home to keep my family safe. That’s so great! I’m so glad you’re enjoying the cleaners! Great work!! I may have missed this somewhere but your spray bottles look like glass – are they and if so where do I find some? Thanks for sharing your knowledge! Hey Karen, I purchase my glass spray bottles from Sally’s Organics on Amazon: http://amzn.to/29C6O2Y. They are my absolute favorite. They sell both amber and clear bottles. Made a batch of this over the weekend and cleaned all the windows of my house. It’s fantastic! Cleans wonderfully and leaves no streaks! Thanks for another great DIY cleaning product! That’s so great to hear, Betsy!! I just washed my windows! They have never looked so good! Thank you! Awesome, Tami! I’m so happy to hear that. Hey Teairro, Like vodka? I think it should work. Wow, Its a wonder! Now my shower glass doors are perfect with the new look. I’ll definitely refer this recipe to my besties. Thanks Kristin. Thanks, Jennifer. Glad you’re enjoying it. I’m also wondering how long this product can be used since it is water based. Hey Lene, It will last about 4 weeks, using distilled water. I’ve found that I use the entire bottle within in this time. You can also reduce the amounts to make a smaller amount.